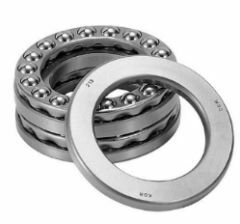 Double direction axial deep groove ball bearings can support axial forces in both directions. Bearings of series 522 and 523 have two flat housing locating washers and do not allow angular adjustment. Bearings of series 542 and 543 have spherical housing locating washers. With an appropriate housing design and in conjunction with seating washers U2 and U3, they allow angular adjustment and can therefore compensate static misalignments between the shaft and housing.